Scoliosis affects between 2 and 3% of the population. 8 out of 10 severe cases are young females. Scoliosis begins in childhood or adolescence. In many cases, the real cause of scoliosis remains unknown. Aesthetic: hunchbacked aspect and short trunk. 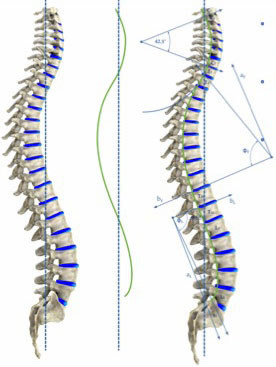 At Langley Sports & Rehabilitation, we base our conception of the ideal spine on the exact geometric model of ideal spinal curves as established by the founder of Chiropractic BioPhysics® (CBP), Dr. Donald Harrison, D.C., MSE, PhD., and colleagues. Based on several studies conducted on healthy subjects, this model displays ideal curvature and reflects optimal postural alignment—a crucial factor in overall wellness. To better understand scoliosis, we first have to take a look at the role of the spine. Is embedded in the pelvis, which is supported by the legs. It allows proper functioning of the lungs and heart. control movement harmony and magnitude.